Still hurting over the news of the passing of Roddy Piper, I thought I would post a photo sent to us of Roddy with the United States championship belt. 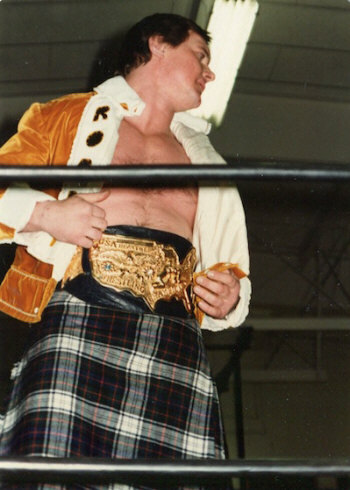 Roddy turned the Mid-Atlantic territory on its head when he came here in 1980. He was a heel like we had never quite seen here. Of course, I think Piper had that effect everywhere he went. His feud with Ric Flair over the title was white hot at the time, and the victory over Flair for the U.S. title would basically end Flair's run with the many regional and national championships over the previous 8 years in the Mid-Atlantic territory. Flair would go on to win the NWA world heavyweight title later that year and hold different versions of the world title over the next 18 years. Piper was truly one of a kind, and is one of the most remembered legendary figures in the history of Mid-Atlantic Wrestling. Photo submitted by Chris Owens / Photo attribution pending. According to information we received from Steve Davies via Facebook, this photo of Roddy was taken at Hopewell High School before a match with Ricky Steamboat. Look for the United States Wrestling Club's feature on Roddy Piper coming Thursday.